The chainmail hauberk was finished, but my desire for medieval projects was not. 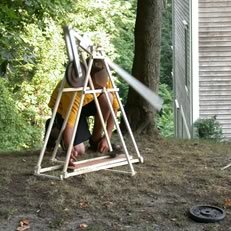 During the beginning of summer 2002 (high school), I started researching medieval siege engines. 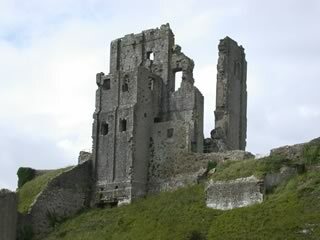 Siege engines were used to pulverize castle walls into rubble. One of the most popular and effective designs was the trebuchet. I had heard of a trebuchet before, and had seen them on TV (Junkyard Wars, NOVA). They use a suspended arm, one end with a counter weight and the other with the projectile. This projectile was often attached to the end of the arm with a sling (to increase the force and secure the projectile). As the weight pulls down one end of the arm, the other arm shoots up, like a seesaw. This transfers tremendous amount of energy into the projectile, which then gets launched out of the sling. After a few hours of reading experiences and plans online, I was hooked. Unfortunately (not really), I was off to England for a month. I gave some of my printed plans to a friend before I left. The tour of England only heightened my desire to build one. I visited many castles, some only ruins because of such weapons. However, after visiting dozens of family and friends, the idea was fading away. When I got back, I was surprised to find out my buddy had started building one from the plans I had given him. The throwing arm was complete, but 90% of the work remained. However, this progress reinvigorated me, and soon, with additional help from my brother, the project was underway. The biggest difficulty during construction was angled cuts. Many pieces came in at angles and had to sit flush against the other piece to ensure a good joint. We couldn’t enlist the support of an angle saw, so a trusty protractor was brought in to assist. However, we soon realized that these manual measurements and cuts were less than perfect. Many of the angles didn’t match up and we had spaces between the pieces of wood, which weakened the structure. We were using glue, as the wood was too thin to use screws. This allowed some fudge factor in the angles, but the completed frame was not great. The other team members were skeptical it could hold more than 10 lbs., but I confidently said it could 45! I decided I better not tempt fate and glued on additional supports to secure the joints. The hanger assembly was quickly completed, after initial difficulties with drilling straight holes. Following the plans, we used a coffee can as our counter balance. However we soon realized that even filled to the top with dirt and rocks, it would not be more than 10 lbs. We wanted more! We eventually scraped that design and used real weights instead (the circle variety used for bench pressing). This worked much better and had less chance of clipping one of the supports as the weight swung through the frame. 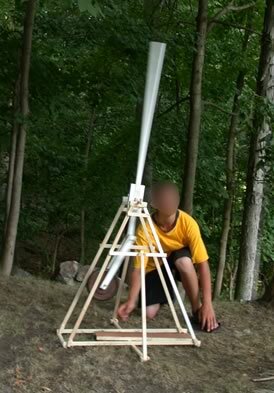 The trebuchet was done in about 10 hours over the course of a week. It was so neat to see the full setup! With the arm hanging, it was an impressive 6-foot tall. We first tested it with 10 lbs. of weight. The frame seemed to be holding. We launched quite a few rocks that day, most going about 40-50 feet. Then we loaded on a 14.3 lbs. weight. This increased the range to about 60 feet. The frame was still performing admirably, so we slapped on the original 10 pounder and another one. After giving each other some worried looks, we fired a shot. It rocketed down the path and into the woods. We estimated about 75 feet, but we agreed that it fired too late (thus producing that very fast, but low trajectory). We loaded it up again, did a slow mock fire to see that the weight cleared the supports safely, and let loose. However instead of a pleasing whoosh sound, we heard a nasty splintering sound. The main axle supporting the arm (a 3/8” wooden dowel) snapped under the force. As the weight fell, the axle levered out the holes they were resting in. Though devastated we didn’t get to see what would have been our best shot yet, I announced I was going to fix the trebuchet and enhance it. It was decided to use a 1/2” steel dowel and to make little troughs for the axle to sit in, rather than a hole. The trebuchet modifications were completed that night and we vowed to beat out old range tomorrow, after the glue had dried. The new design was splendid and we spent no time dawdling. We also applied some WD-40 to the axle and troughs. The design worked nicely with 10 lbs., averaging about 55 feet. The 14.3 lbs. weight also performed better, getting consistently around 75 feet. After many excellent shots, we were ready to go to the next level. Rather than using two 10 lbs. weights, we decided to go to a 25 lbs. weight (unfortunately we had no single weight between 14.3 and 25 lbs.). We felt that the width of the two smaller weights was too near the supports for safe firing. If it were to clip, and no doubt break the wood, it could not only injure the person launching it, but also fire in an unpredictable way. We were very nervous with the 25 lbs., but we rigged it all up and set it on the frame. We were smiling when we saw the frame take the weight, but we knew it would experience a lot more force during the firing. A nice smooth rock was found and placed in the sling. It was the biggest rock we had attempted yet, bigger than a golf ball in volume. I was selected to be the launcher. We checked and rechecked the release path to see if the weight would clip, but everything looked good. The count down was started and the sling was released. It seemed like slow motion from my location. I saw the sling disappear from my hand, gliding to the back of the machine. The weight dropping as the 4-foot arm arced gracefully over my head. The sling opened up at a good angle, close to 45°, and whoosh the rock went. We were ecstatic when it landed just beyond the 75-foot marker. We had more than doubled the rock weight and still achieved a comparable distance to our other throws. We quickly located a smaller rock, perhaps the size of a quarter in diameter, loaded it and let it fly. We lost sight of it as the rock when rocketing down the path. We heard a loud crack as it hit the gravel far up the road. No one saw exactly where it landed, but we know it easily passed our 100-foot marker. The consensus was about 125-150 feet. We scrambled to get a similar rock, and my brother was sent up the path to see where this shot would land. Everything was ready and I let the sling go once more. Disaster. One of the pieces that the axle rested in broke free of the frame, sending the throwing arm off-course diagonally. It hit one of the supports and crashed to the bottom of the frame with a concussion of sound. There lay our project in pieces on the ground. None of the wood had actually split, but rather the joints had come apart. I, once again, offered to repair it, but after some discussion, we all agreed it was time for it to retire. 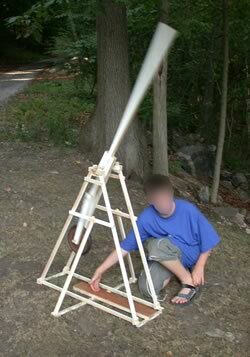 I had thought about plans for a new trebuchet after day one, and now with the success of the smaller version fresh on our minds, we were ready to build a serious one. This one would stand 5 foot high, with an 8 food throwing arm, and be able to take over 200 lbs. of weight. 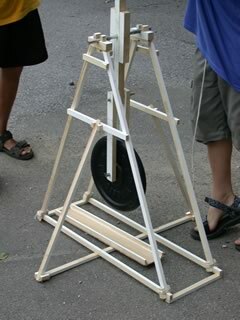 Go to the Trebuchet 2 project page.